The coming weekend sees Wales take on England in the Six Nations Championship. 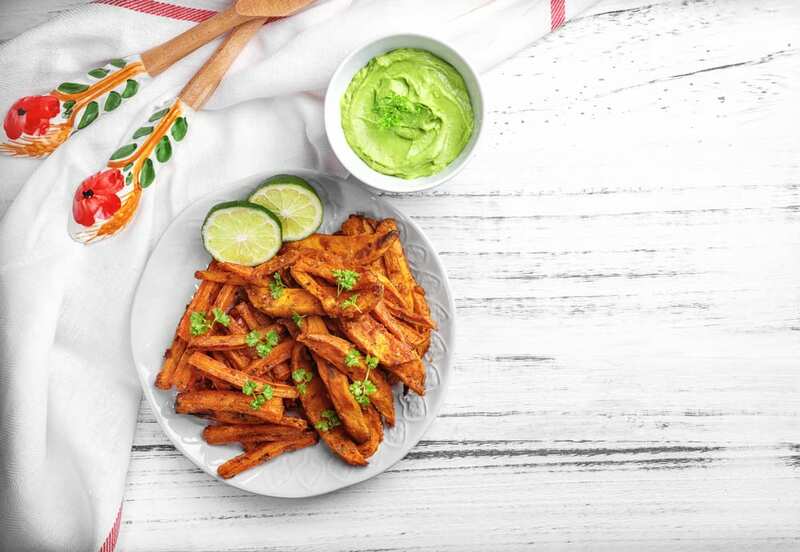 Now, we know that snacking is essential during the game and so whether you’re entertaining guests or wanting to indulge; enjoy these healthy loaded sweet potato fries! Not only are our sweet potatoes loaded with nutrients (vitamin A, B, C, fibre and minerals), they’re also delicious! We’ve made our recipe suitable for vegetarians, but if you fancy adding a bit more flavour, why not top with cooked chorizo? Go one step further and swap your sweet potatoes for purple sweet potatoes. Not only will this enhance the flavour of your dish but also make it much more colourful! 4 of your 5 a day! Preheat your oven to gas mark 6/200C/400F and line two baking trays with baking paper. Prepare your vegetables by chopping the peppers, tomato and onion into bite sized pieces and crush the garlic clove. Cut all the sweet potatoes into fries. After this, place them into a large bowl and toss them in the oil and salt until they are well coated. Arrange the potatoes in a single layer on the lined baking tray and spread out. If the potatoes are too close together, they will not cook as well. Bake for around 30 minutes, until the potatoes are tender. Once the potatoes are cooked, transfer them all onto one tray so that they form a large pile. Sprinkle the grated cheese on top of the potatoes, the chilli and red pepper flavours in our red Leicester will work great with this dish! As well as the cheese, add the peppers, onion, tomatoes, garlic and chorizo (if you’re non-veggie). Return to the oven for another 15 minutes, or until the cheese is melted. Serve with slices of lime and add chopped coriander to garnish. You could also incorporate halloumi into this dish by cutting into strips and serving with the fries. If you want to be the ultimate entertainer this game-day, then why not create a delicious guacamole to go alongside this dish? All you need for this is some hass avocado, garlic and any other tasty ingredients you want to include. Just mash the avocado with a fork and add the juice of a lime for a simple guac! If you enjoy these delicious loaded fries, then make sure you share a snap with us on social media with the hashtag #CuttingVegRecipes.